Businesses die without traffic, whether online or offline. As a business owner, whether you operate individually or are part of a franchise, you need to learn how to generate customers from seemingly nowhere. While real estate agents have various strategies for driving foot and telephone traffic, such as through yard signs and flyers in key places, another great way to drive traffic and phone calls is online. If you are not receiving enough leads, the first place to look is the top of your funnel and the number of people seeing your services as they go about their home search online. Oftentimes it is a waste of time to focus on converting more users if you do not have enough users in the first place. And if you need them, I have local SEO consultants who can help you drive more business. Let’s talk through the different top of funnel acquisition channels and how you can leverage them for your real estate business. Everyone talks about SEO, but in my experience very few in the real estate world actually understand what is necessary to do in order to drive traffic to your business. 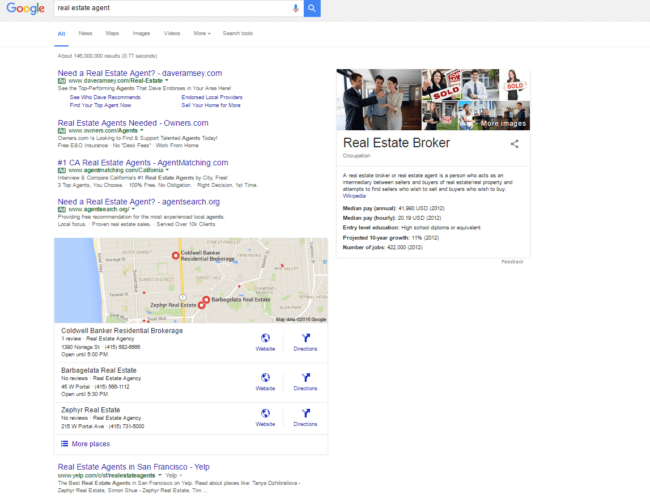 While true that you will rarely be able to compete with the large portals like my former employer for the head keywords like [(city) real estate], there are still many ways that you can drive local SEO traffic to your property. At this point in your marketing, you are focusing on the broader types of keywords that can bring big traffic, and then taking them down the funnel. You’re optimizing for things like [(city) real estate] [(city) real estate prices] because your potential customers are just beginning their search. Other than optimizing your local listings to appear in this pack (many good resources on this here), you can expand the number of pages on your site that can rank in the search engines by answering questions that your potential customers are searching for. As you may know, the best way to rank your site for the queries that will drive you traffic and leads is inbound links from other websites. We’ll talk about that further down in the referral marketing section, but start thinking about the places you could easily get links from, such as Meetup groups you sponsor or local business directories. People buy from those they trust. In real estate, people have different desires when it comes to finding the right agent. Some care about local knowledge, others care about the ability to find the right deal and access to hard-to-find listings, and still others care about the amount of time you spend with them. All of these come down to trust. Everyone does research online these days. They look at reviews, statistics, and read websites talking about their area of interest. Trust me, my wife and I are currently considering buying a home and I am doing a ton of research into our areas of interest. Because this is how people shop, it is also where you need to be. Begin by identifying the sites that tend to rank for the terms your audience is searching for, then create a piece of content around this term for your own site as well as pitching ideas to other sites in your area. By taking a strategic approach to publishing guest content on local sites, you can over time build a net of content around the Internet that can funnel people back to your own website property and therefore to your business. Email marketing is the most underutilized marketing channel for most businesses. If you are creating content on your own website, you should also be collecting email addresses so you can send them the content you are creating and over time answer their questions and build their trust that you are indeed the expert in real estate in your area. Email marketing is usually a mid-funnel marketing strategy and we will talk about it there, but I also want to talk about an email marketing top of funnel strategy – “barnacle email marketing”. Many publications conduct email marketing to their readers to let them know about new content or the best content they’ve found recently. Some of these will also mention articles not published on their own site, simply because the content is so good that it will add outsized value to their readers. Barnacle email marketing is a way of talking about getting your content that is published either on your own site or theirs into these email blasts to get your name in front of their existing audience. By being strategic in this way, you can drive people to your own website or get them familiar with your brand through someone else’s built audience. 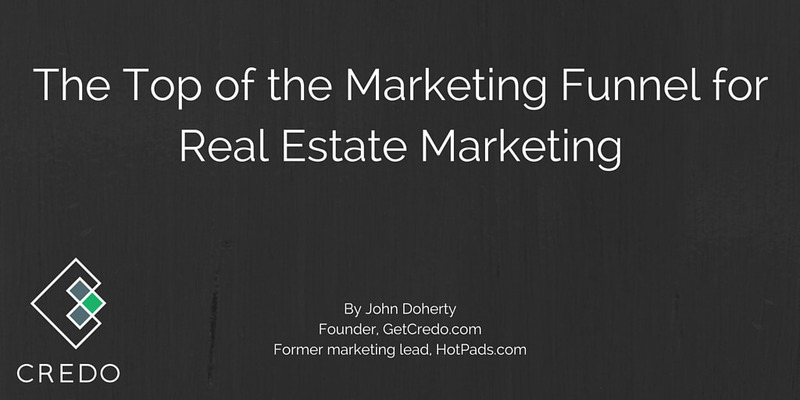 Another often underutilized marketing channel at the top of the funnel is referral marketing. I’m not talking here necessarily about paid referrals from others for sending you business, though that is a strategy that has worked for others (and I’ve run businesses that work that way). What I am talking about here is making sure that you can be found where the searchers are. Every vertical, from real estate to counseling to digital marketing, has places that have become the canonical place to go to find an expert to help you accomplish something – buy a house, get therapy, or grow your traffic. We have already talked about using content as a referral mechanism and slowly yet pointedly building a net of content around your local area where you can funnel people back to your website, but let’s talk more pointedly now about directories. 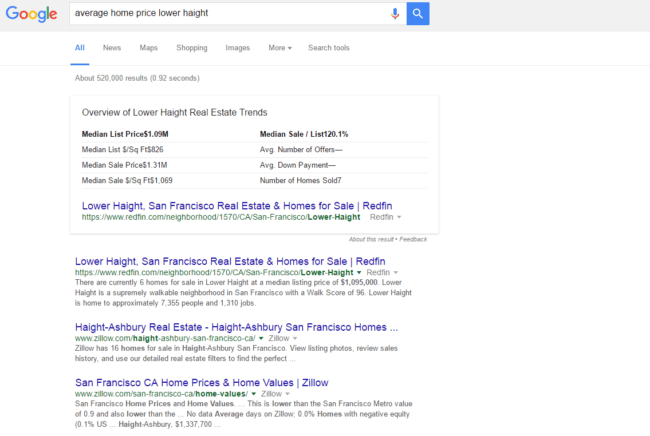 I come from the world of SEO where directories are looked down upon as being bad for link building. But when we expand our view of what directories can accomplish for businesses, we start to see that they will often rank quite well for the queries that are out of your site’s reach (because it’s not strong enough). 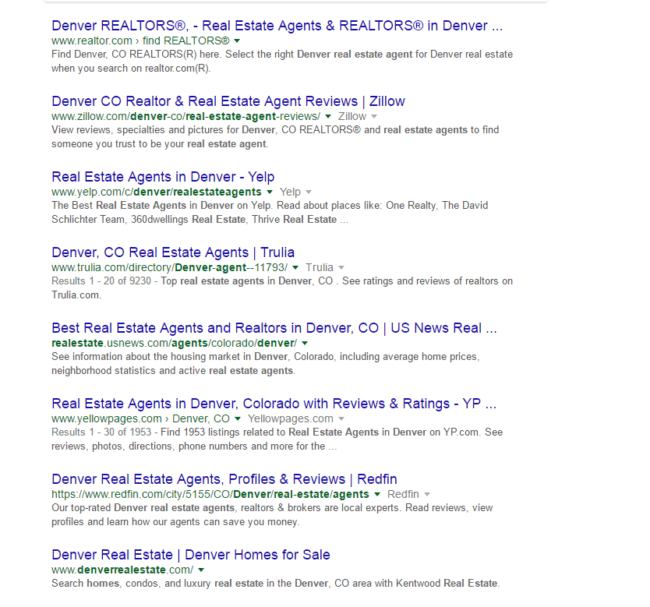 Your site likely cannot rank for this query if you are a Denver real estate agent (though any professional SEO will know a few ways for you to rank better). But, you can get listed on a lot of these sites and learn how to rank your profile higher so that you can get more business from them. Some of these are paid listings. As a business person, you should weigh the cost of inclusion against the potential for new business. If you spend $300 a month and close one $360,000 sale where you get 10% as a buyer’s agent, you all of a sudden have a 10x return on your investment. I’ll take that any day as a business owner! I would be remiss to not talk about paid acquisition in this section on top of the funnel marketing tactics. While I am unabashedly proud of being a marketer working in the organic acquisition arts, the reality is that paid acquisition can work really well for getting new people into the top of your funnel. Google and Bing are by far the leaders in search in the United States. As such, they get almost all of the search ad dollars spent every year. With a bit of knowledge (or hiring the right pro), you can generate leads at a fairly low cost per acquisition (though you should keep an eye on this number) and then implement some strategies in the middle of the funnel to bring them to a conversion event. 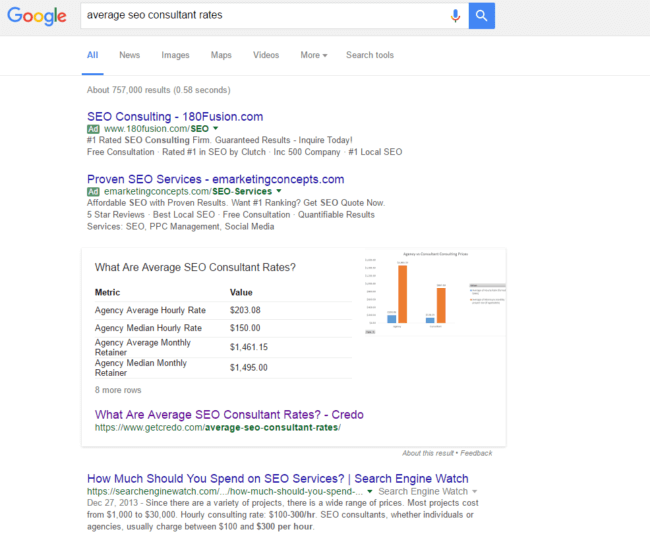 Here is a great beginner’s guide to PPC if you need it. Alongside Google and Bing, everyone and their grandmother (literally) is on Facebook. According to Business Insider, the average American spends 20+ minutes on Facebook each day, and you can often find people posting asking for recommendations for a plumber, a restaurant, and even a real estate agent (see….). Facebook’s advertising revenues have skyrocketed since their IPO in 2012 and their targeting options are incredible. You can target women between the ages of 28 and 34 who live in a specific area who make over $100,000 a year and like gardening. Sounds like a great person to market real estate to, right? You can do that on Facebook, and the clicks are often very cheap.